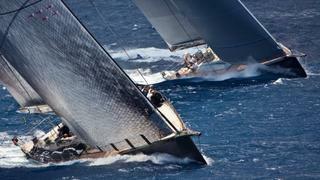 Day 1 of the Loro Piana Superyacht Regatta 2011 in Porto Cervo tested the 27 crew and their yachts to their limits, and beyond in some cases. Broken sails and halyard strops mean a busy evening for some crew as they work to have their yachts ready for tomorrow’s race, but the sailors relished the challenge of today’s changeable conditions all the same. Video highlights and photos from today's racing are available to view on the Loro Piana Superyacht Regatta website. The larger and less manoeuvrable yachts in the Cruising Division are governed by a new set of safety rules, including a 40m exclusion zone to avoid any close calls that could result in a collision. The 19 yachts in this division also started at two-minute intervals, the fastest setting out last. Even if there wasn’t the boat-to-boat drama of the Performance Division, the wind had a few surprises up its sleeve. After virtually no wind at start time, the breeze built nicely to 15 knots, but later gusted higher. Just before the finish, a storm cloud just off the entrance to Porto Cervo caused the wind to turn through 180 degrees and created even more work for sailors on the foredeck as they scurried to change from spinnakers to headsails. The owner of Marie, the 54.6m Vitters ketch, commented: ‘It was an exciting race with up to 25 knots of wind, which caused a lot of broken halyards and headsails. We broke our head sail early in the race during a tack.’ Timoneer and Saudade also had trouble with sails and halyards, pushing them back in the rankings on corrected time. Dr. Peter Wacker’s Fitzroy Yachts 38.8m Ganesha won the Cruising Division by more than three minutes from Harry Macklowe’s Unfurled, with Hasso Plattner’s lightweight Baltic 147 Visione tearing past the rest of the fleet to finish in 3rd. In Performance, Irvine Laidlaw steered his Reichel-Pugh 82-footer Highland Fling XI to victory ahead of Pier Luigi Loro Piana’s My Song. Y3K lies in 3rd, although this evening’s protests could yet alter the standings. This evening, the superyacht owners in attendance look forward to the Loro Piana Owner’s Dinner, hosted at the Yacht Club Costa Smeralda. A menu devised especially for the occasion will be prepared by the chefs of the 3-Michelin-starred restaurant Da Vittorio. Guests will also enjoy an intimate musical performance by world famous tenor Piero Mazzocchetti and acclaimed flutist Andrea Griminelli. Today was an exhilarating start to the regatta, and it looks set to continue with a brisk forecast for tomorrow’s race.